The ConvairLiner was another clean break for civil aviation after the 2nd World War: it had become clear in the United States that there was a whole world open for travel and by air was the quickest means (for those who could afford it). The first model, Convair CV240, struggled with the competition of the war-surplus C-47s (Douglas DC-3). The next model, CV340, was faster and bigger. 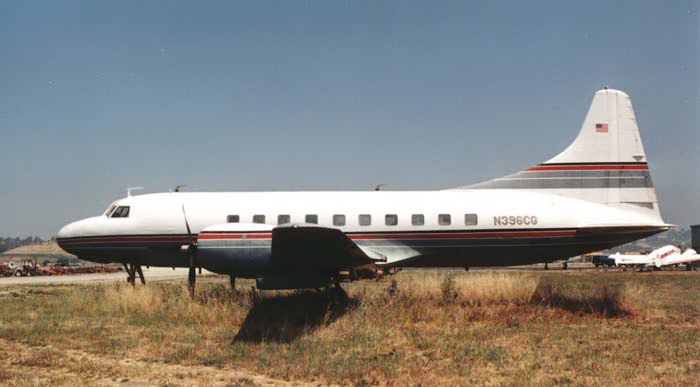 The Convair CV440 brought sales to over a thousand Convairliners. The US Air Force and US Navy ordered CV440s as well and they remained in use till the end of the 1980s, a sure sign of success. Most early model CV240s have since found their way to scrapyards and desert storage, but the improvements on the CV340/440 as CV580 and CV640 are still around in considerable numbers. And so, after taken to the air in the 1940s, these Convairliners still ply the airways in the 21st century. This Convair is one of the oldest models produced, a CV240. N81599 has c/n 53-25 and the last CV240 model produced was 53-26. N81599 was delivered to the USAF in nov.'54 and designated a C-131A (52-5805). It spent much of its service life in Europe, based at Rhein-Main. 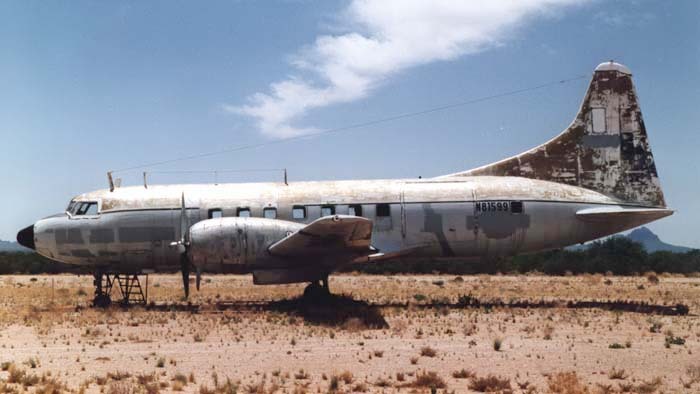 In 1975 it was stored in the desert of Arizona, at Davis Monthan AFB. It was assigned its present tailnumber N81599 in may 1989, when it was registered for Central Air Service. It remained at Avra Valley for a few years, where I took this shot in 1993. It was registered in dec.'96 for Starship Inc,Tucson and reportedly sold to a Mexican owner in 1997, but never went there and was reported in 1999 still in Tucson. Beauty is only skin deep, but this one could do with some work, I say ! Well now, this one looks much better ! 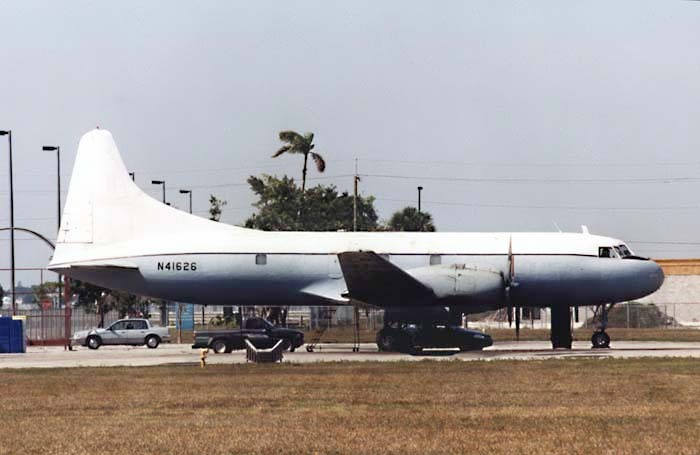 This is a CV340 model, cn 274, designated C-131B when it was delivered to the USAF in sep.'55 as 53-7822. It moved thru various departments of the military, e.g. FAA and Systems Command. This one too ended up in desert storage (MASDC=Military Aircraft Storage and Disposition Center, Davis Monthan AFB, Tucson,AZ) in dec.'87. It was registered to Mr Steven G.Penning in 1991 as N41626 and changed owners under the same tailnumber in dec.'93, to Miami Air Lease. The situation had not changed in feb.'99 when I took this photo at Opa Locka,FL. This one looks even better, but is in fact older. Cn 93 is a CV240 and was delivered as VH-TAS to Trans-Australia Airlines ("James Cook") oct.'48. Consider that, for a minute. In 1956 it went to Pakistan Int'l Airlines (AP-AHS). It went Dutch as PH-NLP for Fokker (operated for Euravia) and came home as N559R for Beldex Corporation (july'60). It was reregistered as N396CG for Faberge Inc in sep.'70 and flew for movie star Cary Grant. It went thru various owners, incl Howard Hughes in the 1970s. It was stored in Pontiac,MI 1982-1986. C&M Airways,TX bought it in aug.'89, but it was registered to another owner a few months later… It was leased by Renown Aviation, as a freighter, in the early 1990s. This photo was taken when I visited Camarillo,CA in may 1997. It flew passengers for flag carriers, VIPs for Hollywood and now it sits disgarded by cargo operators while the grass grows high around it…. Gil White wrote me: I noted on your website was the ex TAA (Trans Australia Airlines) Convair VH-TAS. My father was one of the first 10 pilots to be employed by TAA back in 1946 and he flew this aircraft many times before moving on to the Vickers Viscount. Gil wrote an excellent history on this aircraft and sent it to me early 2005. You'll note the crewlist of the delivery flight to Melbourne-Essendon (VH-TAS 'James Cook'). History caught up in April 2007 when Mary Wilson wrote: "My father, who is 90, claims to have been on the first delivery flights of the CV240 to Australia. I noticed on your website that the 'James Cook' arrived in Oct. 48" The First Officer's name of the ferry crew: P. Wilson. Alas, the mystery remains unsolved as Mary wrote: "My Dad is Tom Wilson..He was a civilian Technical rep from Hamilton Standard sent along to be an advisor to the Australian crew. They set off from San Diego and picked him up in Montreal, then continued on to London, etc. I wrote to that museum and they said they did not have such a plane! Anyway, my father was not the First Officer." I wanted you to know for all the help you gave me, thanks!" N396CG was sold, or donated, to the Air Heritage Foundation in Aug.2009. The museum is located at Beaver County Airport, Beaver Falls,PA (a little north of Pittsburgh). This must have fallen through as 'noizeedave' on the Warbirds forum WIX posted in May2010: "Hi everyone. I have taken a break from fulltime Warbird"ism" to help relocate a historic aircraft. Cary Grants' Convair 240 has found a home at the museum by LAX, at the Proud Bird Resturant. It will be moved From Camarillo to LAX this year, as soon as funds allow." The posting included photos. This fine Convairliner, cn 24, started life with Hawaiian Airlines as N5506K in nov.'52. Not a bad start… Allegheny Airlines bought it in 1962 and reregistered N8423H. This CV340 was converted to CV440 and further to CV580 (1967). It received tailnumber N5834 after this. In 1975 it ended up stored at Marana,AZ. But the National Bank of Detroit saw use in it, a year later, and Evergreen Int'l Airlines started a lease in 1977. US Airways (Emery Express) leased it and Purolator did the same (reregistered in june '81 N585PL). It was stored again at Marana dec.'82-june '84. Summit Airlines operated it for 3 years afterwards. Then it was Lincoln Airlines turn. It received its Canadian tailnumber C-FAUF dec.'87, when it was bought by Soundair Corp./Air Toronto. 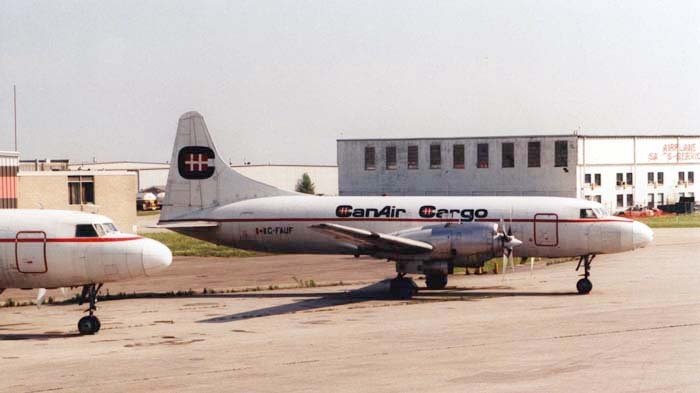 Canair Cargo tried its luck with it in nov.'90, but it went bankrupt in 1997. I took this photo in july '98 at Toronto, where it was stored. But it entered the 21st century operational with Air Tahoma in Ohio, which was a comforting thought, but.. The Federal Aviation Administration (FAA) revoked Air Tahomas AoC effective January 14, 2009. A recent audit resulted in many findings related to "systemic problems" involving record-keeping, maintenance and operations. Convair CV580 cn 151 is seen here awaiting duty at Vancouver,BC in aug.'99. The sun is setting and often that means those props will soon sputter to life… This aircraft was delivered to Pan American (Mexicana) feb.'54 as N11151. That same year it changed over to National Airlines. Thru Lockheed Aircraft Corporation it went to Allegheny Airlines in 1960, where it was modified from CV340 to CV440 and later to CV580. In 1967 it was reregistered as N5823. Aspen Airways bought it in aug.'76. Air New England leased it for various periods. 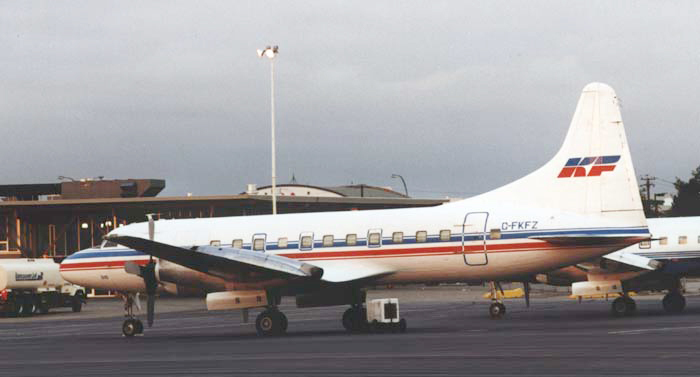 It entered the Canadian Civil Register as C-FKFZ, when it was bought by Kelowna Flight Charter, an undisputed expert on Convairliners (as an operator, but also for maintenance and modifications). N94226 spent most of the 1980s in storage at Marana,AZ. US West Financial Services bought it in 1990, but it stood stored at Sherman-Grayson County, Texas. Until Aircraft Leasing Inc bought it oct.'91. 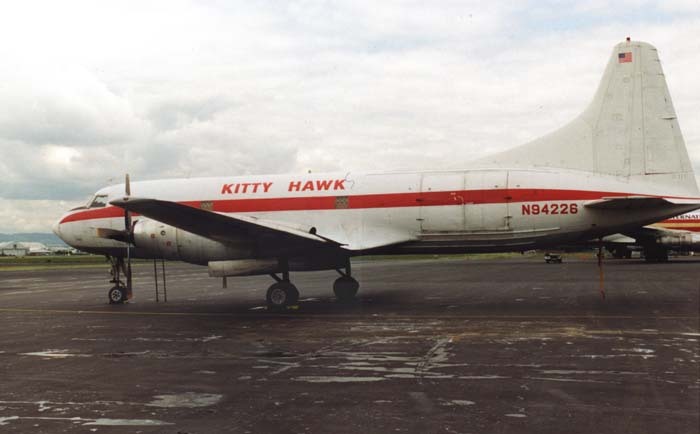 It was leased by Kitty Hawk Cargo when I came across it at the airport op Portland (PDX), OR. Meanwhile it has changed owners again: in 1999 it was seen operating for Rhoades Aviation from Columbus,IN. CV580 N566EA (cn 381) was delivered to SABENA in dec.'56 as CV440 OO-SCT. This ended in 1968 when it was bought and delivered to Frontier Airlines as N73167. It was re-delivered in sep.'68 as a CV580. Frontier Leaseco was registered as owner in may 1983. It operated for Frontier Commuter from 1983-1984, then it was registered to Metroflight Inc (American Eagle) feb.'86. SAAB Aircraft Holding Inc bought it july 1987, but all it did was put it on hold at Marana,AZ. Then ERA Aviation came to the rescue in 1989, registering it as N566EA. Since then it has been faithfully operating on scheduled services and charters in Alaska. This photo has been taken at Anchorage in july 1995. I found the reception at ERA less open, less friendly, to airline enthusiasts than other propliner operators. Perhaps they copy this from the larger, scheduled airline operators: they appeared more distant. Maybe I should have bought something. ERA Aviation terminated the use of these Convairs (2002?) and this one moved on via Kelowna Flightcraft to Air Chathams (ZK-CIF, anno 2006) in New Zealand. 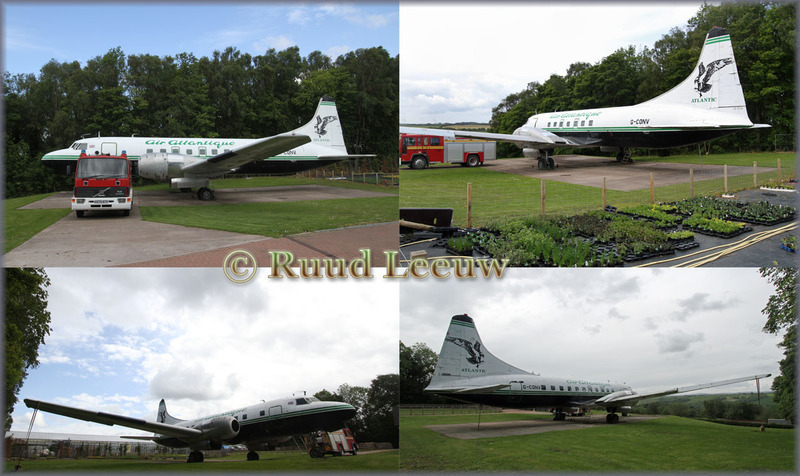 CV580 OO-DHD (cn 135) started life in the Netherlands with KLM as a CV340 PH-CGK (reregistered PJ-CVB) in dec.'53. 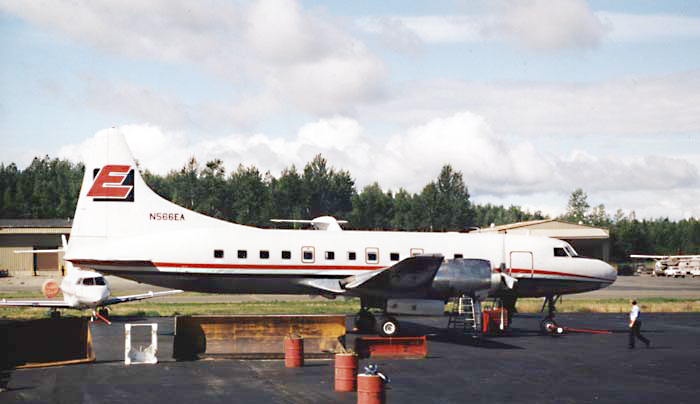 It was converted to CV440 and bought by Lund Aviation (CF-ECS) in jan.'60. Eastern Canada Stevedoring Co. was registered as owner a few weeks later... In 1962 it was converted to CV580. Various owners followed, but it lasted with Allegheny Airlines as N5812 from jan.'66 till 1978. Plymouth Leasing (N582PL) bought it and Evergreen Int'l Airlines used it, so did Interstate Airlines. 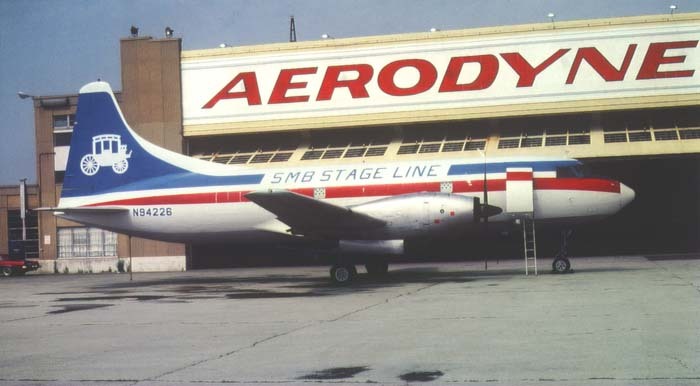 In june '82 Air Traffic Service bought it, and leased it to Summit Airlines in 1983. Air Traffic reregistered it as N536SA in feb.'87. European Air Transport (DHL) started a lease oct.'87 and so I came to photograph it at Amsterdam Int'l Airport Schiphol in oct.'94. Apparently two Convairs have been registered CF-ECS; one is this one, but there was another one... See my page Photos by Friend & Guests (28). 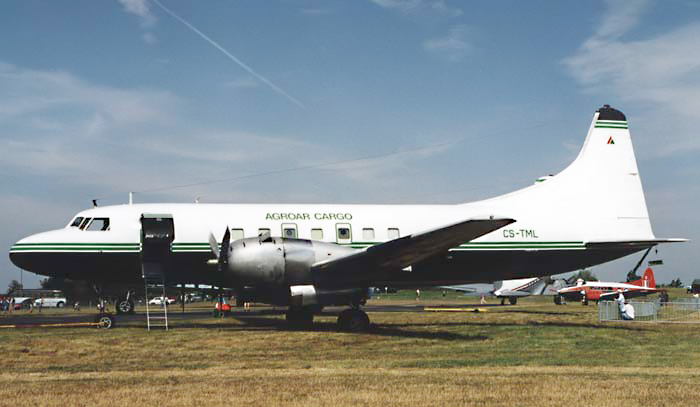 Cn 484 was delivered to Mohawk Airlines in july 1959 as a CV440. After a long and faithful servicelife, it went on to Executive Airlines Boston in june 1971. It was repossessed by First National Bank of Boston in dec.'71. Probably something to do with money... Wright Airlines bought it in mar. 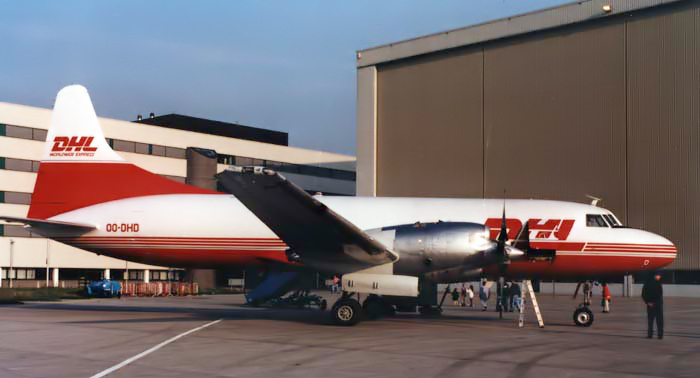 '71 and it was registered to Key Airlines in 1976 as N28KA. For some reason it was reregistered to N28KE in 1984. Basler Flight Service Inc bought it in june 1986, but the next year it went to Salair (registered may '88 N357SA). Omni Air Group bought it in nov.'95 and it went to Europe as CS-TML of the Portugese Agroar Trabalhoa Aereos in may 1997. Meanwhile Atlantic Airlines of Coventry (UK) was keen to operate it (oct.'99), but for some reason it failed to register in the UK. So it found a new home at Coventry, but still as CS-TML and that is how I found it in august 2000. It was reregistered G-CONV in Apr01, pending approval of the CAA to issue an new Certificate of Airworthiness; but a test flight (apparently with CAA officials on board) resulted in failure, with damage to the hydraulic system as a result. The aircraft never recovered from that and restoration was shelved. G-CONV is now owned by Andrew and Tricia Scott of the Reynard Nursery in Carluke, Scotland. It is currently being dismantled at Coventry and will be transported by road up north to its new location this Monday 04-Dec-2006, hopefully arriving there the next day. It will then be reassembled and installed at the Nursery (they also have a Folland Gnat there) and converted into a luxury 1 room 'hotel', fitted out like an executive jet. Once finished, it will be available for hire on a nightly basis." The intention was to refurbish G-CONV into a B&B accommodation but this was never realized. 'Amber Scott, a 25-year-old from Carluke in Lanarkshire will be working from inside an upgraded 1950s plane when the refurbishment has been completed. The luxury airliner has been grounded in her parents' garden since they bought it almost 10 years ago. They had planned to convert it into a bed and breakfast, but their plans were scuppered by a lack of time and money. 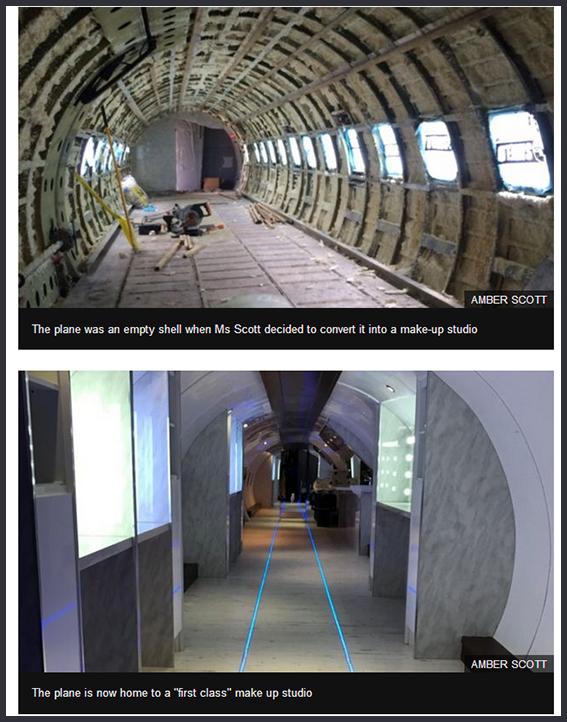 When they suggested Ms Scott use the Air Atlantique plane for a studio in March this year, it was an empty shell. Just six months later, it has been converted into a luxurious salon and is now open to customers. It sits in the garden next to Reynard plant nursery, near Carluke, which is run by Ms Scott's parents. 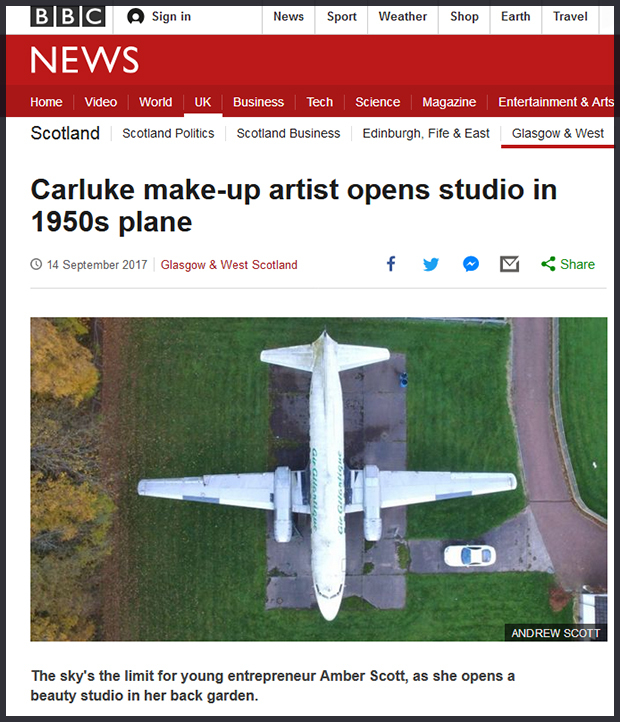 Remarkably, the make-up artist, who trained at Clydebank College and has worked in New York, managed to keep the development secret! "No-one knew except my family and friends," she told the BBC Scotland news website. "No-one knew till yesterday (13Sep17). "Since we went public, the amount of messages I have had is unbelievable. Everyone's been so nice, I'm so happy."